Holy week for a church worker is always busy and hectic, however it is one of my favorite times of year. I love the way our worship service really lasts all week. It is a continuation of the story. 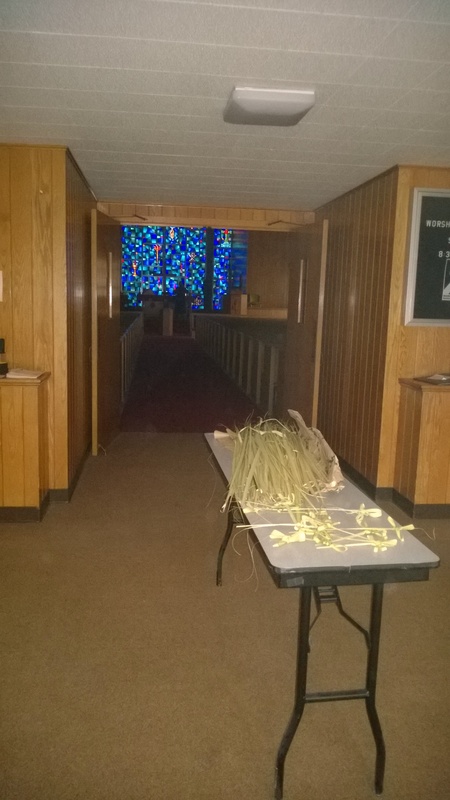 Palm Sunday is the beginning with our king coming to fulfill what he was meant to do. He was meant to be the Messiah who has come to save us. While sitting in the dark I was struck by how amazing it is that we have a God who loved us enough to come in our dark place and be our Messiah. As we shout hosanna, God save us, I am reminded of our need for that savior Jesus. For six weeks we have waited. We have gone through lent and examined the destruction of sin. We have seen the “storms” come upon us. Sunday we examined the real reason Jesus came. He came to save us. He came as a servant who will give himself freely on our behalf. The one who calmed the storm, cast our demons and raised the dead has come to bring us hope in our storm. This week as you enjoy the journey. As you spent time with Jesus on Maundy Thursday, Good Friday, Holy Saturday, and Easter Sunday may you be reminded of the reason the king came to Jerusalem. Not to be crowned the great king but to be the great servant king. May we remember that even in our dark places Jesus has come to save us. And to that we shout hosanna!! God save us! Enjoy the journey my friends.